The Nickel Taphouse and Green Spring Station have a number of deals for Mother's Day. A number of local establishments will be honoring moms with Mother's Day deals this weekend. -- All moms can drink for a nickel at The Nickel Taphouse this Mother's Day. During brunch from 11:30 a.m. to 3 p.m. and during Sunday supper from 5 p.m. to 10 p.m., mimosas, craft beer, bloody mary's and wine are 5 cents each for mothers. You can't beat that. -- You can also head over the Green Spring Station on Saturday from 10 a.m. to 6 p.m. to receive complimentary flowers with purchase. If you shop at multiple stores and receive multiple stems, Becket Hitch will wrap them into a bouquet. Although there is no minimum purchase amount, flowers are available while supplies last. -- Roy Rogers is celebrating Mother's Day by giving mothers a shopping bag (while supplies last) and free combo meal of their choice with the purchase of a kid’s meal from Friday through Sunday at participating locations. As a kickoff to the promotion, participating Roy Rogers locations invite families to its weekly Family Night event Thursday from 5 p.m. to 7 p.m. Kids can create a Mother’s Day card, and those age 12 and under can get a free kid's meal with the purchase of an adult combo meal. -- Save 20 percent on sweaters, jewelry, scarves and other items now through Saturday at The Red Garter. Other sales are excluded from the deal at the Pikesville boutique. Mother’s Day falls early this year on May 8, and restaurants in the Baltimore area are preparing unique brunch and dinner menus for the holiday. The restaurants that follow are among those dishing out specials for mom. Call ahead, as many require advance reservations. -- Save 15 percent on all Deborah Lippmann gift sets using the code "mom2016" at deborahlippmann.com. Lippmann, for those of you who might not know, is a celebrity manicurist whose work is regularly featured on the red carpet — including most recently at the Met Gala. Amazon.com: Mother's Day gifts with free one-day shipping on select clothing, jewelry and shoe purchases. Bank of America's Museum on Us: Free museum visits on Saturday and Sunday with Bank of America credit card. Champ's: Free $20 meal for Mom o May 9-June 12 with entree purchase Friday-Sunday. Core Power Yoga: Bring a speical lady for a free yoga class on Saturday and Sunday. Denny's: Free dessert with purchase of two entrees on Friday-Sunday. First Watch: Free box of chocolates when Mom dines in restaurants on Sunday while supplies last. Groupon.com: Up to 70 percent off Mother's Day gifts and $10 off with coupon code WELCOME for new members. 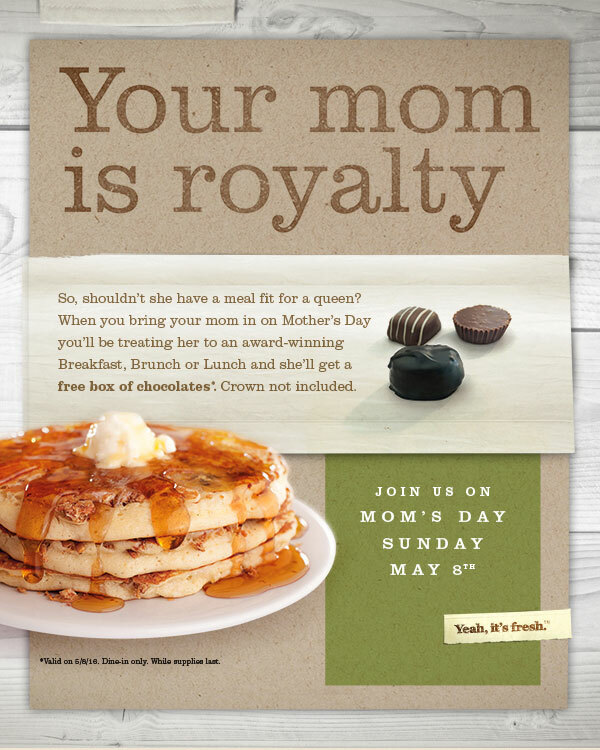 Hooters: Free $10.99 meal for Mom with drink purchase at participating locations on Sunday. Kohl's: $10 off $50 purchase of Mother's Day gift; expires Sunday. LivingSocial.com: 20 percent off gifts for Mom with code TREATMOM through Saturday. Macy's: Free gifts with purchase. ProFlowers: 20 percent off $39 Mother's Day arrangements. Ulta Beauty Free gifts with purchase and $3.50 off $15 coupon. Walgreens: Free 8-by-10 photo with coupon code; expires Saturday. If you have a discount, savings promotion or sale that we should feature, send an email with details to shopping@baltsun.com. But remember, we only want the real deals! Tribune Newspapers reporter Doreen Christensen contributed to this article.